If you are thinking about whether or not to sell a home in Tallahassee, you must first understand your true motivation for wanting to sell. When I first meet with a prospective home seller at my office, my most critical task is to determine the motivation level of the homeowner. While it might not be initially obvious to most home sellers, the fact is that their motivation for selling a home is the single greatest factor in whether or not the home sells. In today's technology driven real estate market, determining the value of a home is a fairly straightforward process and it is very rare that a buyer is going to purchase a home without assistance from either a real estate agent or an appraiser. This means that buyers will not be paying more for a home than most people in the current market think it is worth. Period. Me: Mr. and Mrs. Seller, After reviewing all similar properties that buyers can purchase today, I recommend an asking price between $260,000 and $270,000 to get your home sold as soon as possible. Home Seller: Joe, if we could get $300,000, it would allow us to pay off our mortgage and not bring money to closing. We really need to get $300,000. Me: Ms. Buyer, would you like to make an offer on this home? Home Buyer: Joe, I really like it and would like to offer them $250,000. Me: Ms. Buyer, I am going to recommend you raise your offer to $300,000. It is what the seller needs to pay of the existing mortgage. Home Buyer. Joe, if I'm going to pay $300,000 for a home, why wouldn't I buy the nicer home over on Elm? Of course, that means that home buyers and current market trends determine the value of a home, and home sellers only determine whether or not the home will sell. If a home seller is willing to sell the home at a price the current market will bear, then it most likely will sell. Otherwise, the homeowner will just keep the house. It really is that simple. Trying to sell a home for an amount far more than it is worth is a technique that was used forged in an era when there was no reference of current home values other than the tens of thousands of recorded documents down at the County Courthouse. But today, the information is online, and it is consolidated. The "fudge factor" for valuations is less than five percent, which is reinforced with the average sales price to list price ratio of roughly 97% in the Tallahassee real estate market. The motivation level for a seller determines whether or not a home will sell. If a homeowner absolutely must sell, ultimately, the price will be lowered to a market value that will get the home sold. For example, a family that accepts a job in another market and makes the move is usually a very highly motivated seller. Conversely, a family that wants a house in another neighborhood might not be as motivated. For highly motivated home sellers, my advice is based upon current market conditions, and it has not wavered over the past four years. Price your home to sell fast, because a sale today will yield more than a sale in six months. Home values are declining, and will continue to decline as the market deals with the glut of inventory and the new distressed properties hitting the real estate market in Tallahassee. 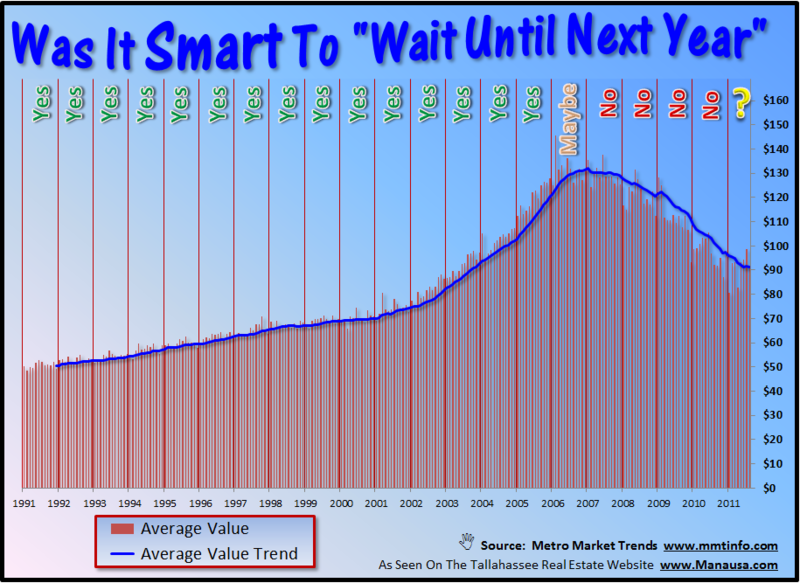 So if you are thinking about selling and maybe want to wait it out, take a look at our graph. For the past twenty years, the results of waiting are shown. Those that took the risk and waited a few months (or years) lost money. They would have been better off with a quick sale in the declining market. Home values are based upon the current supply of homes for sale in Tallahassee and how well it matches up with the current rate of demand. Unfortunately, we have a real estate supply and demand imbalance that will last many more years, so home sellers must determine their own reasons and motivation for selling. Either price your home attractively, or plan on waiting five to seven more years to get a higher price than the current market will bear. If you would like to sit down and discuss your current situation, just drop me a note and I will help you understand how buyers will value your home and also provide you with some solutions that will help you make the best decision for you and your family.